From Oct/Nov. newsletter, another Puzzle Layers card. For myself, I felt this card screams Fall. Love the rich colors. Again, this graphic is from Magic Moonlight graphics. And as you can see there’s no stamping just bold papers from Graphic 45. Hope you enjoy the card, give this technique a try, it’s easy. Wow, this is stunning. 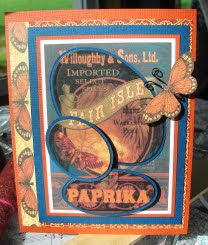 I love the paper, and that butterfly really adds a nice touch. Amazing how beautiful you can make a sheet of paper look! Love this Vada! Have a beautiful Fall weekend! 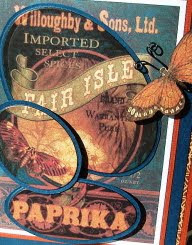 I think beautiful paper and images are all you need to make beautiful art. Oooooo, quite unique & quite creative! Love it! how unique! love it Vada!